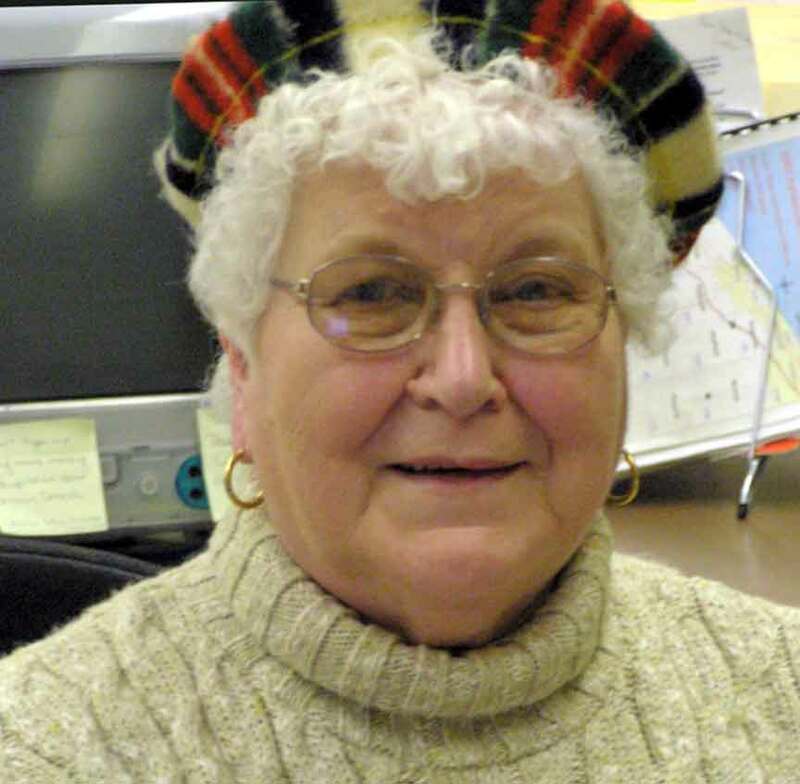 EDITOR’S NOTE: Last Tuesday, March 19, The News Editor Doris Cook passed away, and the Gazette Newspapers family mourns a beloved co-worker who left a lasting impression on the community and the newsroom with her decades-long career in journalism. This week marks the start of a two-part series in honor of Doris. This week, please read a column she wrote in 2001 reflecting on her career in journalism, in her own words. Next week, read memories of Doris by those who knew her best her family, friends and members of the community who read her articles on a weekly basis, as she covered their council meetings, school events and more. I never actually planned a career as a journalist back in 1959. It just happened out of the blue one day when the Geauga Times Leader correspondent for Middlefield, the late Alma Hall, called me on the telephone. Alma was my neighbor down the street in Middlefield Village. She mentioned something about not feeling well and having health problems at the time. She asked if I would be interested in taking over her job as the GTL Middlefield correspondent for just six months. Six months didn’t seem long to me. Those six months, much to my surprise, later stretched to 38 years. My career as a journalist has been exciting, even disappointing at times, but most of all rewarding. First I worked as the county weekly’s correspondent for Middlefield. Here I was the mother of two active preschoolers and pregnant with my third child. I had always been interested in writing since high school. I knew a lot of people in town and as I pondered her request initially, my thoughts were, “Why not?” Even with expecting our third baby, I figured Alma could take the job back after our Warren was born. Over the years in the “thick and thin” of my job, long hours of juggling a career, home, caring for the kids, I always had my husband Bruce’s support. Even when my reporter duties took on a few dangerous assignments, which ranged from uncovering corruption in local government, handling the police and fire beat stories, to covering those late-night township and municipal government meetings, I still had Bruce’s support to stick with the job challenges. I got the chance to cover a spectrum of stories those years at the GTL, and my stints later at two different newspapers, writing all those wonderful special feature series, meeting and interviewing the famous and infamous folks who make the news headlines of a small-town daily. When I started in this business, I had to first borrow a portable manual typewriter. That first typewriter was to be well used and on my “kitchen office” counter for years. In 1959, the Geauga Times Leader office was in Burton on the second floor of what is today the Huntington Bank Building. My job as correspondent was to gather by phone, of course, all the tidbits of what village residents were doing or who was visiting in town with relatives, etc. School news was also included in those columns. The Geauga Times Leader was owned and published by the Donald C. Rowley family of northeast Ohio newspapers known as the Rowley chain. The Times Leader had gone through a series of owners before the Rowley chain purchased the weekly. Geauga County had no daily newspaper at that time. I was with the GTL as we converted from a weekly to a daily, even including a Sunday edition jointly with the Painesville Telegraph. The staff hustled to get all the news that was fit to print, as the editors continually pointed out to us. We usually scooped the bigger dailies around us in those great “golden years of newspapers,” as I oft times refer to that period of time in Geauga County history. As a weekly publication, the GTL had correspondents (mostly women writers) from all the communities in Geauga writing columns. Once a year, the publisher hosted a luncheon at the old Chardon Lakes Inn for the correspondents and we got to connect the names with the faces of our co-workers. Our columns were due on Monday or Tuesday a.m. at the latest in the news office. Sometimes I would load the kids in my car and deliver the news. Reporters today in this hi-tech world of computers in newsrooms around the country would be amazed at how those weeklies were published. I wonder how we did it at times! Back in my Button Street kitchen, at times it was bedlam as deadline neared. I would be talking on the phone gathering news items while keeping two active youngsters, Scott (our oldest son), daughter Laura, then our youngest son, Warren, born in January 1960, from getting into mischief. I was a “stay-at-home mom” when I began my writing career. The Times Leader in the early 1960s moved its office from Burton to Chardon, the county seat. We were located in the old stately Smith house on East Park Street, now the site of the main library branch for the Geauga County Public Library system. It was in this news office that I began working part-time in the summer months of 1965 as a reporter/photographer, then started full time in fall 1966. The staff was small. It comprised of our editor Don Freeman at that time, full-time reporter Keith Evans from Parkman, society page editor Dorothy Babbitt (now retired and living in Burton), and a full-time photographer, who doubled doing all the film developing and photo work. Staff changed a lot in those early days, editors came and went. I’ll always remember Freeman shoving a camera in my hand one summer afternoon, giving me a quick lesson on loading film and sending me off for a farm shot somewhere down county. I came back with a pretty great shot of wheat stacked up. I was on my way. We finally got a few new 35mm cameras to use and our photography improved. At least mine did, although sometimes I forgot to put film in it. editors to be tough at times, but they all had a compassionate side. It was a learning experience every day on the job as I reflect. We used Associated Press news copy as well as local news in the GTL in the 1970s through the 1980s. Formats changed and news coverage emphasis changed as a new editor would take over the job. The staff was small, but there was a wonderful camaraderie shared in the work place. I left the Geauga Times Leader in 1986, about 14 months after the Rowley family sold the chain to a New Jersey conglomerate headed by William Dean Singleton. His company later sold the papers to Thompson Newspapers out of Ontario, Canada. Leaving the GTL, I took a job as community weekly editor of The Valley News, part of Gazette Newspapers Inc. in Ashtabula County owned by the Lampson family. This was a whole different career switch for me. Here I was back doing a little bit of everything from reporting to photography and editing a newspaper. Challenging? Oh, yes, very definitely. I had certainly mastered computers by now. Each week I even pasted up copy when needed after arriving at the Gazette production department in Jefferson in the a.m. hours every Wednesday to get the paper out on time. After almost nine years as editor for not only The Valley News, but as the first editor of The Shores News covering Roaming Shores Village, I yearned again to make another career switch. This time I joined the Star Beacon staff in Ashtabula and went back to Geauga County as bureau chief in Middlefield for the daily newspaper. In 1997, I decided it was time to slow down, so I retired from a full-time job. I, however, according to Bruce, still have ink in my veins and still do freelance writing today. I’ve had my share of honors working at the GTL and Gazette papers, winning awards from the Associated Press and Ohio Newspaper Association for stories, photos, columns and from the Ohio Newspaper Women’s Association (ONWA). I still hold membership in the ONWA today. When computers came into use back in the 1980s, it was a big change for me at the GTL. I thought, how do you teach an old dog new tricks? I admit using a cheat sheet at my side for the first week or so after we switched over. I still kept several old manual typewriters at home. Finally they went into a garage sale when I moved to Orwell. My last electric typewriter ended up as a donation to a friend. I decided it was too complicated to use as a word processor. Doris was born Feb. 19, 1932, in Evansville, Indiana, and was the second child of John Henry and Catherine (White) Bowman. Doris and her family moved to Middlefield when she was a child and she resided her entire life in Middlefield and Orwell, where she has lived for 30 years. Doris was best known as the editor for the News, Gazette Newspaper’s south county paper, and could be spotted with her camera at just about any event in the Grand Valley and/ or Middlefield area. Doris began her illustrious news reporting career in 1959 as the Geauga Times Leader’s District Correspondent for Middlefield. It was to be a temporary job for about six months. Over the past five decades she covered it all including murder trials and the Reagan-Carter presidential debate in Cleveland. She also met President George H. W. Bush and was the only female reporter who toured on a bus with Prince Charles of England on his visit to northeast Ohio. Earlier this month, Doris retired as the Senior Editor from Gazette Newspapers. She had served as editor for 20-plus years. Doris met her husband of 61 years, Bruce Cook, while he was visiting his grandparents in Middlefield while on leave from Japan at the end of World War II. The couple was married at Middlefield United Methodist Church on July 22, 1951. They were blessed with three children: Scott (Leigh Ann), of Painesville; Laura Walters (Jeff), of Munson; and Warren of Orwell. They were the proud grandparents of nine grandchildren, and four great-grandchildren, who will sadly miss her. Doris is also survived by her loving sister Judy Bettis (Ed) of Skaneateles, NY, and many nieces and nephews who adored her. Services for Doris will be at the Century Village Historic Church, 14653 East Park Street, Burton, where Doris served as Tour Education Director for five years. The family will receive visitors Friday, April 5, from 4-7 p.m. and Saturday, April 6, from 10 a.m. until noon, at which time there will be a memorial service led by Pastor Laurie Krieg. A private interment will follow at a later date. In lieu of flowers, memorial donations may be given to the American Cancer Society or the Hospice of Western Reserve. Best Funeral Home of Middlefield will be handling the funeral arrangements and condolences may be left at www.bestfunerals.com.